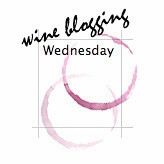 This month’s Wine Blogging Wednesday (WBW) is hosted by Fork and Bottle and the theme is "Biodynamic Wine". Now I know very little, if anything really, about Biodynamic Wine but Fork and Bottle has tons of information and resources. With information I gleaned from their site and articles they’d linked to I went in search of an entry for this month. When I got to my local wine shop and asked about biodynamics the first thing out of my knowledgeable wine person’s mouth was, "Now you know biodynamics may contain sulfites?". Or maybe that was actually the second thing as I think he first confirmed that they had several bottles to choose from. After assuring him that I wasn’t looking for biodynamics for health reasons but for "community" reasons we set about looking at many of the various options. I would say all of the options but to be honest they had too many and so I cut off the search after a bit. Several of the first wines he mentioned and showed me happened to also be on a list I’d printed off after finding a link on the Fork and Bottle site. 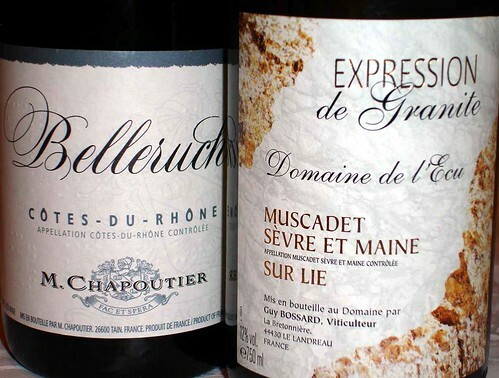 What I found interesting about these wines is that although they are known for being Biodynamic wineries many of them did not carry the Demeter certification. Like "organic" there are certain costs, testing and fees needed to qualify for the certification. Not all wineries feel the trade-off is worthwhile and so, while they may follow the practices, they are not certified. Biodynamic is a bit of a loaded term. Besides the agricultural aspects of the practice there are the bordering-on-pagan (my description) rituals that many do not necessarily buy into and, in fact, this is probably the major, uhm, discussion point, among believers, non-believers and fanatics. With that bit of background let’s get to this month’s tasting. Jack has long been a believer in this process and challenged us to see if we could tell any sort of difference in Biodynamic wines. 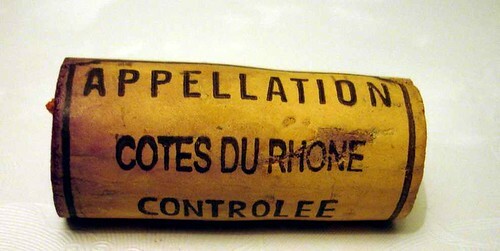 Tonight I opened the red, a non-Demeter certified Côte du Rhône, Belleruche Cotes-du-Rhone M. Chapoutier 2005. After pouring it into my glass I noticed that there wasn’t much on the nose. The color was a nice, deep plum. The first taste seemed rather light. I let the glass sit for a few moments to see if it would open some and then tried again. Not much had changed. In the mouth it felt thin but was pleasant. I kept trying to identify some specific taste but the wine was very elusive. The flavor would dissipate before my mind could record any sort of recognized flavor. At one point though, I actually had the impression of toasted marshmallow! I have no idea where that came from. Basically, I would say this wine was rather flat; there was little complexity or structure. It was, however, still a pleasant wine. It was the sort of wine I’d be happy picking up in a neighborhood shop in Paris, taking back to my hotel room and sipping while nibbling on finds from one of the traveling street markets. It was not a wine I’d take to a dinner party, especially if I was hoping to impress my hosts or the other guests. The one thing that did surprise me was that this wine was only $10 in a state (Washington) that heavily taxes alcohol. I would have expected that Biodynamic wines would be more expensive than their non-Biodynamic counterparts. Even the other wine that I have on hand, the one that is Demeter certified, was only $14. Of course at this point I have no idea what it is like. In summary, I can’t say that I’d search out this wine again. On the other hand if it happened to turn up at an event I was attending I wouldn’t run screaming either. I think it’s fine for a picnic or as a light lunch wine but then again, that’s the description for many Côte du Rhône. I can’t say I saw any identifiable difference between this one and one grown in a non-Biodynamic vineyard. The round-up is in process and you can read it here. Maybe the wine was in a dumb stage? It is light (elegent?) if you\’re looking for a huge Cotes du Rhone, but I\’ve just cracked open a bottle (I\’m drinking it as I type) and am blown away by the sweet cherry in the nose. And yes, only $10. I\’m definitely going back for more! Anything is possible, but I tried really hard to get this wine to display anything more than a fleeting impression. This wine was actually reviewed by two others for this event. I think one had impressions similar to yours and the other similar to mine. But that\’s what makes wine tasting so intriguing!